The lobbying scandal in Washington officially hit Licking County this week, if it hadn't already. A new advertising campaign features television, radio and billboard advertising critical of U.S. Rep. Bob Ney, a Republican from Heath, accused of accepting travel, meals and golf outings in exchange for official favors. 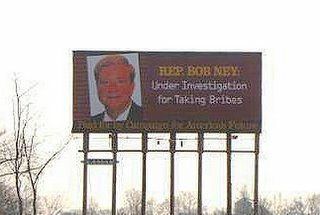 Ney's constituents in Ohio's 18th Congressional District may not have paid much attention to the scandal thus far, but a billboard on Interstate 70 and radio ads scheduled to begin today on WHTH-AM and WNKO-FM may be hard to overlook. The billboard off the I-70 eastbound lanes, at exit 126, one mile west of Ohio 37, shows Ney's picture with the words: "Rep. Bob Ney: Under investigation for taking bribes." Ney moved to Heath last year from St. Clairsville.